The weekend before the season opened, I headed up to the public land spot that I have to do some last minute scouting as well as help the gentleman that will have the spot for the second half of the season set up a stand. After some discussion about exactly which tree we would set it up in, we set the stand up and started doing a little scouting. We found several main trails heading out of the woods. We also found some old rubs along with 1 fresh one. With the season opening during the middle of that week, I was anxiously awaiting the first day I could get out in to the woods and hunt. Little did I know that I’d have 2 deer down so early in the season. That Friday, I was able to get off of work a little early to head up to the Public spot. I decided to sit in the stand that I had helped set up the week before for several reasons. First, there was a southwest wind and second, due to a late arrival it was a stand that I could get in without too long of a walk. The short walk allowed me to have as much hunting time as possible. Once in the tree I had 2 hours of hunting time left. The first hour and a half was really slow. I didn’t see anything at all for the first hour and a half. Right around sunset, I saw my first deer. It was behind a fallen tree slowly walking across the marsh. Being behind the fallen tree, I couldn’t tell what it was until it got passed the tree. 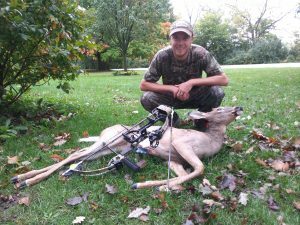 I had previously ranged the trails there so I knew that if it was a deer I wanted to take, I’d have about a 30 yard shot. When the deer stepped out from behind the tree, I immediately recognized that there were no visible antlers. With that, I drew back and let the arrow fly. 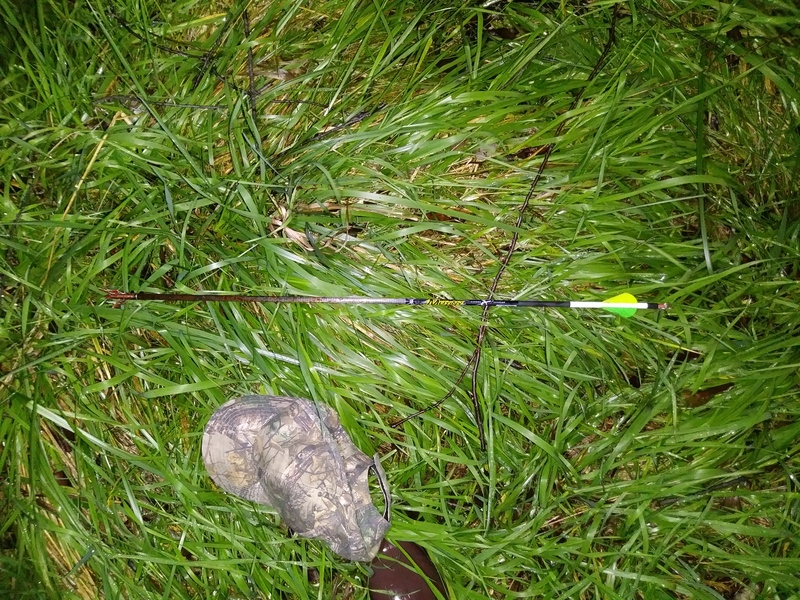 I watched the arrow hit it’s mark right where I wanted it and the deer took off. I was confident felt that the track job was going to be quick. I gave the deer about 45 minutes before getting down from the stand. Since I wasn’t going to have any help with the track job, I went back to the truck to drop off most of my gear. Once ready, I took up the trail. As it turned out, the trail was easier to find than I expected as it was right on the trail I had used to enter and exit my stand. That’s when things stopped being easy. The blood was exactly what I wanted, lung blood. The problem was that there wasn’t a whole lot of it. The grass was wet which made following the trail quite the task. The blood trail ended up being only 60 yards long. It took me about 30 minutes to find the deer. When I first saw it, I knew I might have made a mistake. The deer was small. Don’t get me wrong, I’m not against shooting fawns. I just try to go for older deer. When I opened up the legs, my fears came true. A button buck. Regardless, I was excited to start the season off with a deer down. 1 hunt, 1 Deer. This segment will be pretty short. Amy and I went back out the following evening. We were out there early enough that we had plenty of time to pick out our tree and get the stands up. We were sitting on another pinch point of the exit trails coming out of the perimeter of the woods. Unfortunately, we were completely skunked. 2 hunts, 1 deer. The next Friday, I went to work a little late in order to get another hunt in. We had a storm system move through and the temps were far below normal. This time I was hunting at the funnel spot. I was ready to hunt just as first light started creeping in to the woods. That morning, I saw 6 deer total. Since this hunt was filmed, you can catch most of the play by play through the video. My microphone battery had started to die so I have narrated the entire hunt. Long story short, I was able to harvest a doe. 3 hunts, 2 deer down. For more details on the Funnel spot hunt and the after hunt video from the button buck, check out the video below. Hope you enjoy!